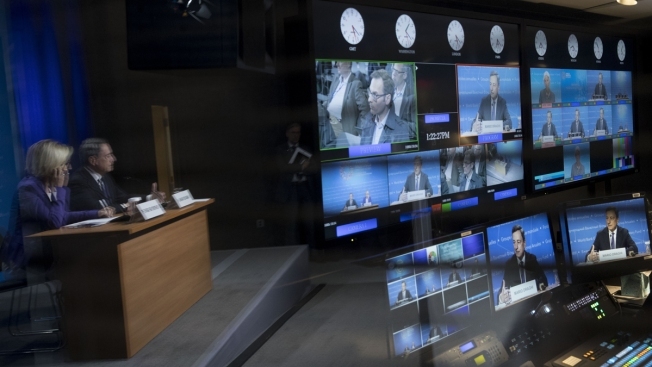 This Oct. 14, 2017, file photo shows a European Central Bank news briefing displayed on monitors in a television control room at the International Monetary Fund in Washington, D.C. Most Americans experience fatigue from the unflagging 24-hour news cycle, the Pew Research Center reported in survey results released Tuesday. "Almost seven-in-ten Americans (68%) feel worn out by the amount of news there is these days," Pew researchers said in a report, "compared with only three-in-ten who say they like the amount of news they get." Republicans were more likely to experience news fatigue, with 77 percent saying they were overwhelmed by the amount of coverage. Sixty-one percent of Democrats had the same response. The numbers are based on a sample of 5,035 adults 18 years of age or older, surveyed online from Feb. 22 to March 4, 2018. Pew's researchers also found that respondents who disapprove of coverage are even more likely to feel news fatigue — in that group, 80 percent said they were affected. But even among people who approved of news organizations’ reporting on important stories, about half of respondents reported a similar impact. News fatigue is also common among those who follow the news “only when something important is happening.” 78 percent of those respondents reported feeling worn out. Of respondents who follow the news all the time, 62 percent said they felt the same. NBC News host Chuck Todd joked about news fatigue in light of the Pew study on "Meet The Press Daily" Wednesday, promoting a mock prescription drug called Oblivia that comes with side effects like "atrophied smartphone thumb" and "involuntary smiling." "Feel like yourself again, before the news took over everything," he said. This week, Apple revealed it will be rolling out features that help people track the time they spent on their iPhones, addressing concerns that the devices have become addicting. Among the new features will be more ways to manage notifications, which often come from news outlets.